Stephen Baylis fights past Tristan Thompson. Baylis scored a power play goal Saturday (Photo by Todd Pavlack/BGSUHockey.com). Frederic Letourneau scored the Falcons’ first goal at 9:54 of the first period. Kylar Hope gave the Nanooks their first goal at 12:26 of the first period. Stephen Baylis’ power play goal at 7:16 of the second period and Justin Woods’ marker at 8:54 of the third period capped the game’s official scoring. Bowling Green had power play chances in both the first and second overtime periods but couldn’t convert. The game would eventually go to a shootout, where Chad Staley’s wrist shot beat Bednard. Brett D’Andrea’s chance was turned aside, giving the Nanooks an extra point in the WCHA standings. The game will count as a 2-2 tie for NCAA/Pairwise purposes. Ryan Bednard finished with 29 saves on 31 chances, while Anton Martinsson had 36 saves on 38 shots faced. This year’s Falcon squad have been described by Coach Bergeron as being a team that struggles to “flip the switch” when they struggle early in games. Saturday’s contest was a step in the right direction. After a sluggish start in the first period where Bowling Green was outshot 12-8, the Falcons outshot the Nanooks 30-19 over the final two regulation periods and overtimes. Bowling Green has a negative 21 shot differential overall in their second and third periods this season. Ryan Bednard got off to a slow start this season, but has turned in two performances that show improvement. Bednard turned aside 29 saves on 31 shots faced, including 10 saves on the penalty kill. Bednard is 1-0-1 in WCHA games this season, with a 1.93 goals allowed average and .931 save percentage. Bowling Green’s penalty kill was 9-of-9 on the weekend and have killed off 11 straight chances. The Falcons improved to 33-of-39 (85%) on the season. Max Johnson took a very dangerous-looking check in the third period as he was driven head first into the boards. The freshman forward needed help skating to the locker room and didn’t return. The penalty called on the ice was a minor for boarding, committed by Ross Heidt. His injury was defined as upper-body by Coach Bergeron during the postgame but no update was available. Tyler Spezia, Chris Pohlkamp, Jacob Dalton, and Jakob Reichert are logging time in the trainer’s room. Alabama-Huntsville fell 3-0 to Cornell and Michigan State throttled Lake Superior 6-0. In conference play Bemidji State shutout Ferris State 3-0 and #12 Minnesota State swept #16 Michigan Tech thanks to a 5-3 win Saturday. 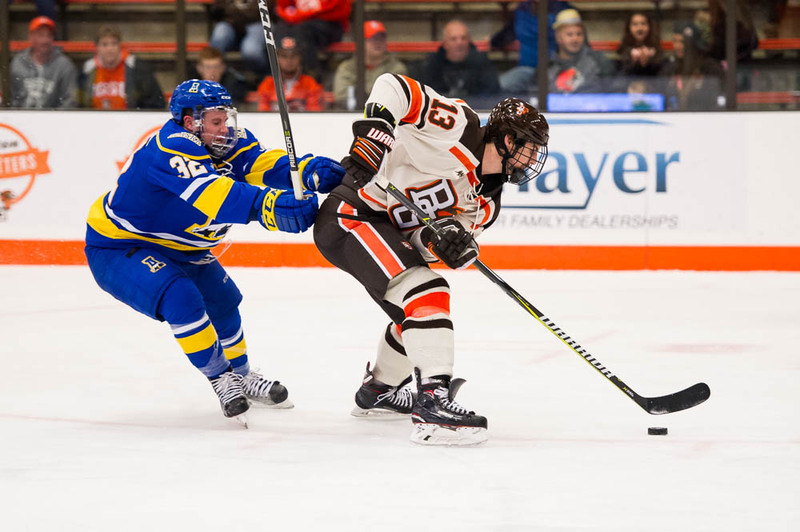 Bowling Green will head north for their first WCHA trip away from the Slater Family Ice Arena when they face #16 Michigan Tech.